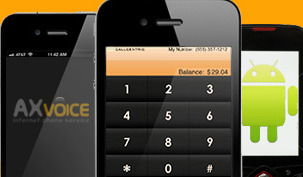 AXvoice offers VoIP phone services and solutions to residential users and businesses. The company main focus/coverage is in the United States and Canadian market. We are committed and determined to deliver the quality and much economical service to our clients. Our users stumble upon the delightful experience of making and receiving the swift broadband phone calls. No need to carry a headphone and computer to use our VoIP service instead just a normal touch-tone phone is required to enjoy the calls. Axvoice offers its customers the most reliable service, much lesser call charges than its competitors, attractively beneficial features and cost-saving plans to rave about. We, claim to be unique with our exceptional services to make our customers at ease. Experience our outstanding VOIP phone service to make and receive calls. Our advanced Internet phone system helps our customers make swift communication with their business partners, customers, friends and relatives irrespective of their location/destination. To read/write a comment, review and Q&A about this provider scroll to down of this page. More companies are listed in business & residential providers pages. What are your thoughts? Let us know in the comments section! 2. How easy to install & use the product/service? 4. Would you recommend this company? 5. Overall: are you satisfied with their customer support, features, reliability & QoS? Then it will appear on the page exactly the way you enter it here. You can wrap a word in square brackets to make it appear bold. For example [my VoIP review] would show as my VoIP review on the web page with your details.